In record-setting fashion, the New York City Department of Records sent copies of death certificates for my great grandfather and second great grandfather, Joseph and Moses Landes, arriving a mere twelve days after placing the order. Meanwhile, I’m still waiting for a marriage certificate for Samuel Herman placed over a month ago. Perhaps I was working on a misguided assumption, but I expected most records requests would take four to six weeks anyway. I originally used the resources on Steve Morse’s website to locate potential ancestral records. I didn’t have precise dates of death for either Joseph or Moses Landes, but census records helped me pinpoint a likely range, and I had confidence that both lived in New York City when they passed away. Turning to Steve Morse, I pinpointed the most likely candidates and placed the order. The names of relatives on Joseph’s death certificate and the address listed on Moses’s death certificate confirm I have the correct records. I added the information to my family tree on Ancestry.com, including complete dates of death, the causes of death, and in the case of Moses, parents’ names. 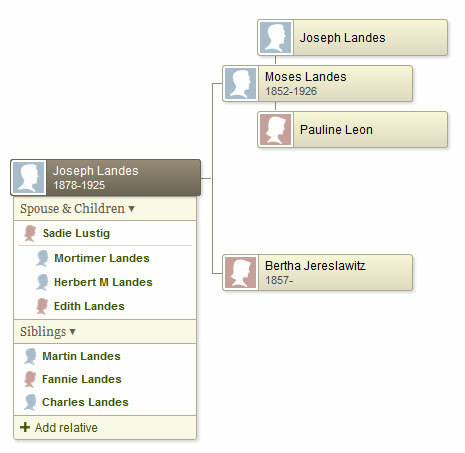 Moses’s parents, my third great grandparents, were Joseph Landes and Pauline Leon. Pauline or its variations Paulina and Pearl have been common names in my family over the course of the last 150 years. 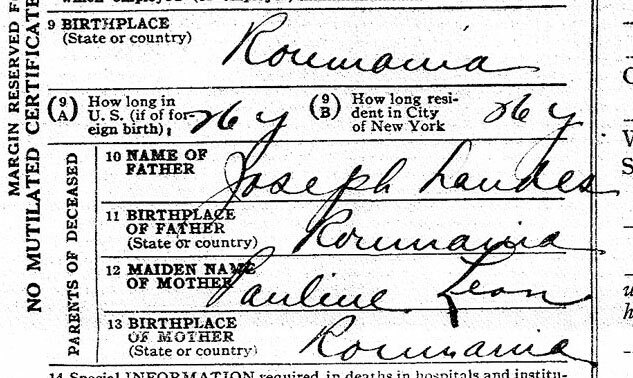 Joseph and Pauline were born in Romania according to the document, but Leon does not sound like a common Romanian surname. Is it possible I have some Spanish ancestry?